Situated in the far east of Asia, Japan is subject to a monsoon climate in the Temperate Zones. Japan has four distinct seasons that affect changes in the demand for energy and electric power. There are two peaks in the annual fluctuation of Japan's electric power demand: one is a summer peak due to the use of air-conditioning (cooling), and the other is a winter peak due to the use of heating. Table 1 shows Japan's total population, its density and its rate of increase. Table 2 shows the Gross Domestic Product (GDP) in total and the growth rate. Table 3 shows the estimated energy reserves in Japan. Table 4 shows Japan's energy supply and consumption. Japan's total primary energy supply in FY2002 was 22,977 PJ. Japan depends heavily on oil, even though its dependency has decreased from 77.4% in 1973 to 49.7% at present. The decline in oil dependency can be attributed mainly to the energy conservation efforts of Japanese industries and the development of alternative energy resources in Japan. In FY2002, Japan imported 99.8% of the oil consumed in Japan. Concerning the nuclear power, it showed a considerable drop of 7.7% in FY2002 compared with the previous year. On the other hand, fossil fuels advanced with coal (3.1%) and petroleum and natural gas (1.4% each). A key feature of Japan's energy consumption is that the industrial sector accounts for the bulk of the total, with 47.2% in FY 2002, while the residential and commercial sector is 28.8% and the transportation sector is 24.0%. The energy consumption of the residential and commercial sector is growing constantly in recent years. Solids 0.46 0.19 0.06 .. .. -9.33 ..
Combustible Renewables and Waste < 0.01 .. .. .. .. .. .. The two oil shocks in 1973 and 1979 had a direct impact on Japan's vulnerable energy structure and inflicted considerable damage on Japan's economy. Because of the first oil crisis, the Japanese government introduced the following emergency measures: Approval of Oil Emergency Measures (1973), Enactment of Two Emergency Laws (1973), Participation in IEA (1974), and Enactment of the Petroleum Stockpiling Law (1975). The first oil crisis prompted the Japanese government not only to formulate various emergency measures as stated above, but also to change the basic philosophy of its energy policy. In 1975, the Advisory Committee for Energy, an advisory council for the Minister of International Trade and Industry (MITI), submitted a report suggesting that developing a stable supply of energy should be regarded as the top priority. On the basis of this report, the following five policy pillars were set up: reducing oil dependency, diversification of non-oil energy supplies, securing a stable supply of oil through petroleum reserves, exploration and development of oil by Japanese companies, promotion of energy conservation, and promotion of new energy R&D. In order to strengthen energy conservation, "The Law Concerning the Rational Use of Energy" was enacted in 1979. In 1974, the Sunshine Project was implemented to promote the development of new energy technologies such as solar energy, geothermal energy, coal liquefaction, coal gasification and hydrogen energy. Various alternative energy policy measures were introduced after the second oil crisis. In 1980, "The Law Concerning the Promotion of Development and Introduction of Alternative Energy" was enacted. The Basic Law on Energy Policy-Making, which aims to indicate the general direction of future energy policies, was enacted in June 2002. Based on this law, the Advisory Committee of Natural Resources and Energy started examination of the Basic Plan for Energy Supply and Demand in April 2003. Considering the views and opinions of the public and of relevant administrative organs, the draft was drawn up and decided at a Cabinet meeting and reported to the Diet in October 2003. It is comprised of three basic policies: 1) Securing a stable energy supply, 2) Reducing the burden on the environment, and 3) Applying market principles. Promotion of nuclear power generation and nuclear fuel cycles is considered one measure to achieve these policies. The plan must be re-examined at least once every three years, and modified as necessary. The Electricity Industry Committee, comprised of non-governmental professionals and experts including some from electric power companies, provides advice and recommendations to The Ministry of Economy, Trade and Industry (METI which was renamed from MITI) on a regular basis, regarding the basic national policies on regional network operations for the stable supply of power, promotion of demand-oriented energy-saving measures, promotion of load levelling, further development of electric power, etc. Based on this advice, METI and related Ministries and Agencies confer regularly with individual power companies to review the up-to-date demand and supply performances and to evaluate the power supply program for the future. Japan is divided into nine geographical zones with an electric power company in each zone. These are private enterprises that specialize only in electric utility operations and are the main power suppliers in each zone. Apart from these, there is also the Okinawa Electric Power Company, a smaller electric utility company operating in Okinawa Prefecture, which comprises many small islands. These power companies run their own facilities from power generation to transmission and distribution as an integrated business operation. The Electric Power Development Company, which has its own thermal and hydro electric power stations, and the Japan Atomic Power Company, which has its own nuclear power stations, are other private enterprises that produce electric power and act as wholesalers to the nine electric power companies. However, in relation to Japan's total installed capacity, their installed capacity is relatively small. With the amendment of the Electricity Utility Industry Law in 2000, a number of system reforms were implemented, such as partial liberalization of the retail supply to extra high-voltage customers. To improve competitiveness, the government established fair and equal rules allowing suppliers other than electric utilities (new entrants) to use power transmission lines owned by power utilities ("wheeling rules"). Also, electric utilities are obliged to notify METI of the wheeling service rates. Source: IAEA Energy and Economic Databank, 2009. Enactment of the Atomic Energy Law (1955) introduced the promotion of atomic energy development and utilization toward peaceful objectives in compliance with the three basic principles of Democratic Management, Voluntary Action, and Open Information. Inauguration of the Atomic Energy Commission (1956) established an advisory board for the Prime Minister on matters regarding promotion of atomic energy development and utilization. Long-term program for Research, Development and Utilization of Nuclear Energy (Long-term Program) was formulated in 1956. Today, it is the basic program for the nation on nuclear power development and utilization. The plan is revised and updated every five years. The MITI was reorganized in 1966 to accommodate its increasing workload. This change provided additional rules and regulations for the introduction of commercial light water reactors in Japan after 1966. In 1974, three basic laws for the promotion of electric power development were made into law; namely, the "Law for the Adjustment of Areas Adjacent to Power-Generating Facilities," the "Electric Power Development Promotion Tax Law," and the "Special Account Law for Electric Power Promotion." These laws also advanced the appropriate siting of nuclear power stations. In 1978, the Nuclear Safety Commission was formed as a separate entity from the Atomic Energy Commission. Safety assurance measures were enhanced in 1980 in order to reflect the lessons learned from the TMI-2 Accident (1979) and, later, the Chernobyl No. 4 Accident in 1986. The overall appraisal of the Vision of Nuclear Power in 1986 provided long-range prospects of energy availability and electric power requirements through 2030, and a program for enhancement of safety called "Safety 21," which further reinforced safety assurance measures. In 1990, Japan revised its supply targets to include alternative energy sources to mitigate its growing demand for oil and its part in the greenhouse effect. In 2001, the Nuclear and Industrial Safety Agency (NISA) was formed as a separate entity from the Agency of Natural Resources and Energy of the METI to hold jurisdiction over matters of nuclear and industrial safety. 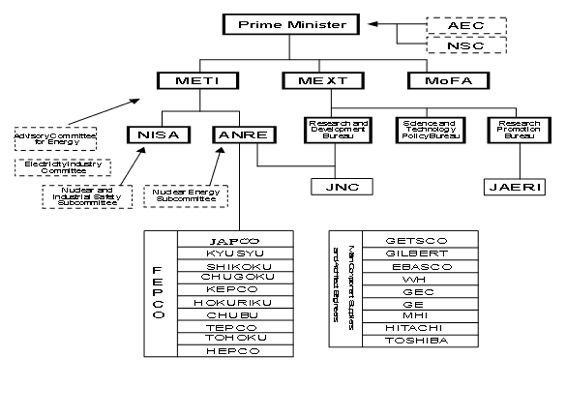 Figure 2 shows Japan's organization chart in nuclear power, comprising government regulatory authorities, electric power companies and contracting engineers/suppliers. The Japanese government carried out administrative reform in January 2001. The Atomic Energy Commission and Nuclear Safety Commission (NSC) of the Cabinet Office gives high-level independent and proper directions to other ministries and agencies. The Ministry of Education, Culture, Sports, Science and Technology (MEXT) was created through a merger between the former Ministry of Education, Science, Sports and Culture and the Science and Technology Agency (STA). In MEXT, three Bureaus and four Divisions are in charge of nuclear energy. MEXT is responsible for the administration of nuclear energy for science and technology. Its key roles are nuclear research and development (including nuclear fuel cycle, Fast Breeder Reactor (FBR), quantum research, fusion, and accelerators), utilization of radiation and radioisotopes, nuclear liability, safety regulation and disaster prevention for nuclear reactors for testing and research, use of nuclear fuel material, and regulation for ensuring peaceful use and safeguards. It is also responsible for supervision of the National Institute of Radiological Sciences, the Japan Atomic Energy Research Institute and the Japan Nuclear Cycle Development Institute. The Ministry of Economy, Trade and Industry (METI) will be in charge not only of those areas that it had been involved in previously - as the Ministry of International Trade and Industry (MITI) - or taken over from STA - related to the nuclear fuel cycle business (refining, enrichment, fabrication, reprocessing and waste disposal), but also regulation of nuclear reactors including Monju that is in the research and development stage for use in generating electricity. Nuclear power-related issues will continue to be the responsibility of the Agency of Natural Resources and Energy. In addition, the Nuclear and Industrial Safety Agency (NISA), with its ten sections related to nuclear energy, was added as a special institution, to play a central role in safety regulations for industrialized nuclear power. NISA is responsible for regulating nuclear safety. The drafting of safety regulations and the licensing of milling and refining, nuclear fuel fabrication, spent nuclear fuel reprocessing and storage, disposal of radioactive waste and decommissioning of nuclear power plants, are now carried out by NISA. A double check system of safety review of nuclear facilities by NSC and NISA or MEXT is continuously adopted. The Ministry of Foreign Affairs (MoFA) is responsible for the international aspect of nuclear energy utilization, including the implementation of the related international treaties and conventions. HEPCO: Hokkaido Electric Power Co.
TOHOKU: Tohoku Electric Power Co.
TEPCO: Tokyo Electric Power Co.
CHUBU: Chubu Electric Power Co.
HOKURIKU: Hokuriku Electric Power Co.
KEPCO: Kansai Electric Power Co.
CHUGOKU: Chugoku Electric Power Co.
SHIKOKU: Shikoku Electric Power Co.
KYUSHU: Kyushu Electric Power Co.
JAPCO: The Japan Atomic Power Co.
MHI: Mitsubishi Heavy Industries Ltd.
GEC: The General Electric Co. Ltd.
GETSCO: General Electric Technical Services Co.
Table 7 and Figure 3 provide lists and locations of the nuclear power plants in operation, under construction and firmly planned, together with those out of service in Japan. As of the end of the fiscal year 2010, the total capacity of nuclear power generation was 46,821 MWe. The total capacity of nuclear power generation of plants under construction was 2,650 MWe (2 plants). The following table shows trends in the capacity factor by reactor type. In April 1996, MITI announced the "Basic Concepts on Aging of Nuclear Power Plants," which comprised two ideas: 1) MITI had the outlook that existing plants could be operated for a long term after MITI had made a technical evaluation of instruments as crucial factors in long-term operations; the instruments were important from the viewpoint of safety, but not easy to replace or repair, and 2) MITI requested that power companies should carry out technical evaluation and make long-term maintenance plans for each instrument including replaceable ones in plants by 30 years from the start of their operations. MITI adjusted these concepts as specific measures in February 1999. According to these, electric companies reported to METI technical evaluations and long-term maintenance plans in 1999 and 2001, and METI judged the report to be appropriate. In October 2003, NISA of METI added the Aging Management Review in the provisions of "Periodic Evaluation of Nuclear Reactor Facilities" to "the Rules for the Commercial Power Reactors" and provided as one of the requirement in the Operational Safety Program to implement Measures for Aging Management. extract new maintenance measures from the technical evaluation results to make a plan of ten-year maintenance program. NISA requested license holders to report the newly extracted maintenance measures in the ten-year maintenance program of "Measures for Aging Management" to reflect the results on inspections, such as the Periodic Inspection, as necessary. Licence holders should materialize methods of maintenance management, frequency and time, etc. of the maintenance measures into ten-year maintenance program. Licence holders should implement those in accordance with Operational Safety Program. Since the "Measures for Aging Management" was defined as a requirement of the regulation, more rational and standardized Measures for Aging Management will be investigated and will be provided as academic and association standards etc. in the future based on recipe to aging in abroad and on the latest knowledge. NISA evaluates the technical evaluation and ten-year maintenance program conducted by license holders with the incorporation of the of specialists' opinion, as well as the lessens learned from operating experiences in and outside Japan and the latest knowledge, and experimental results. Technical evaluation and planning of the ten-year maintenance program in relation with the aging were implemented for nine out of fifty-two units as of June 2004. The development of light-water reactors in Japan began with PWRs from Westinghouse and BWRs from G.E. As nuclear power technologies are incorporated by the domestic industry, successive expansion projects of nuclear power plants are of Japanese design and construction. Today, Toshiba, Hitachi and Mitsubishi Heavy Industries have emerged as Japan's representative suppliers of nuclear steam supply systems (NSSS). Construction of nuclear power plants is made possible by an industrial system with one or more of the above-mentioned three companies acting as the prime contractor (s), and forming a joint venture with contract engineers or construction companies as subcontractors. The development of the Advanced Boiling Water Reactor (ABWR) started in 1978 as a project of international co-operation among five BWR vendors. The resulting conceptual design plan was highly evaluated by TEPCO and other Japanese utilities, and as a result, the ABWR was included in the third standardization program starting in 1981. The preliminary design and numerous development and verification tests were carried out by Toshiba, Hitachi and GE together with six Japanese utilities and the Japanese government. Two ABWRs, the Kashiwazaki-Kariwa Units 6 and 7, were ordered by TEPCO and began successful commercial operation in November 1996 and July 1997, respectively. Two more ABWRs are under construction at Hamaoka-5 and Shika-2, another ABWR is under licensing review at Ohma-1, and eight more ABWRs are in the planning stage. These eight future ABWRs will achieve a significant reduction in generation costs compared to the current ABWRs. The cost reduction is to be obtained by the following means: standardization, design modifications, and improvements in project management. In addition, all of the experience of the ABWRs currently operating will contribute to cost reduction. It is Japan's fundamental policy to dismantle and remove decommissioned nuclear power generation facilities that have completed their service life, while ensuring complete safety in that process. Based on this fundamental policy, the standard procedure (standard work schedule) is one of "safe storage plus disassembly/removal". It is appropriate to choose a safe storage period of five to ten years and a disassembly/removal period of three to four years. The estimated cost of reactor decommissioning in Japan (referring to precedents in other countries), is approximately 30 billion yen (1984 prices) for a 1,100 MW-class nuclear power plant, when its safe storage period is five years. The Agency of Natural Resources and Energy is implementing verification tests of reactor decommissioning technology such as techniques of decommissioning waste processing, and techniques of reactor remote dismantling, which are important in ensuring better safety and reliability. In Japan, five companies have provided steam generators for nuclear power plants: for BWRs these are Toshiba, Hitachi, G.E., and G.E. and Toshiba jointly, while for PWRs these are Mitsubishi, Westinghouse, and Westinghouse and Mitsubishi jointly. Many companies are capable of supplying equipment and services to Japan's nuclear power industry. These range from the suppliers of major equipment and machinery to those supplying ordinary equipment or offering engineering services. They also include firms related to the nuclear fuel cycle or nuclear fuel recycling. Figure 2 shows the nine electric power companies which operate commercial light water reactors, and one company which is a producer and wholesaler of electricity from nuclear power in Japan. Regarding nuclear power plant operator training in Japan, both the BWR and PWR groups have their own training centres. These were financed, built and utilized jointly by the member companies of each group, comprising electric power companies and contracted engineering firms. In addition, each electric power company has its own training facility. Engineering qualification tests for operator certification are conducted at training centres operated jointly by the member companies. The representative suppliers of Japan's maintenance services are Toshiba, Hitachi and Mitsubishi. The electric power companies make contracts with these maintenance service companies. 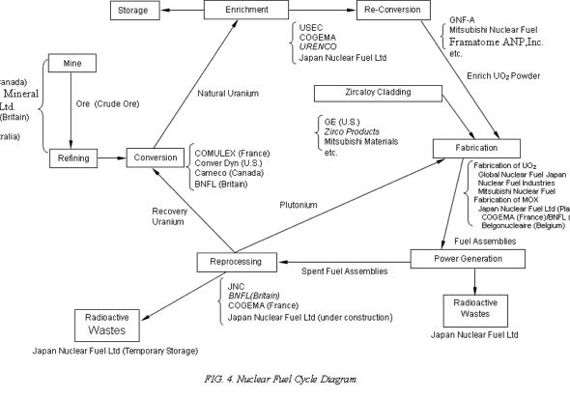 Fuel cycle activities in Japan comprise enrichment, conversion, fuel fabrication, zircaloy cladding, reprocessing and radioactive waste activities. Figure 4 shows the enterprises involved. In promoting the research and development of nuclear energy, the government should play a leading role in implementing research and development projects that require long-term commitments, specifically those aimed at identifying and commercializing potential capabilities of nuclear power as a promising energy option in the years ahead; and basic and generic research and development activities to acquire diverse knowledge and information as the intellectual assets of humankind. When any research and development project achieves results that should be put to practical use, it is important for the government to assist highly-motivated private corporations in carrying on their activities for the commercialization of such results. Another important task of the government is to jointly work with private corporations - prospective users of new technologies in future markets - from the viewpoint of efficiently promoting research and development projects and smoothly implementing the transfer of technologies in the years ahead. In leading the world in the area of nuclear energy research and development through these projects, it is important for Japan to promote creative research and development in a competitive research climate and to steadily carry out these projects with diverse options and sufficient flexibility to properly respond to the latest information and ever-changing social requirements. For this purpose, the government should timely and properly assess research activities and have its findings properly reflected in subsequent research and development programs and in the allocation of available research resources. Concerning, in particular, research and development projects that are closely related to social needs, it is important to undertake these projects with the specific users in mind. The Atomic Energy Commission (AEC), amongst other responsibilities, advises on R&D. The long-term program for the development and use of nuclear energy is revised by the AEC every five years; the latest revision was published in November 2000. Government responsibilities for R&D are shared between the Ministry of Education, Culture, Sports, Science and Technology (MEXT) and the Ministry of Economy, Trade and Industry (METI). MEXT is responsible for planning and administration regarding nuclear energy for science and technology. It has three bureaus, each with several divisions. MEXT plays a key role in nuclear research and development of many areas, including the nuclear fuel cycle, FBR, fusion research and accelerators. MEXT supervises the work of the Japan Nuclear Cycle Development Institute (JNC), which was established in 1998 as a successor organization of Power Reactor and Nuclear Fuel Development Corporation (PNC), and also that of the Japan Atomic Energy Research Institute (JAERI), established in 1956. JNC is the main channel for the development of advanced reactors and establishment of the fuel cycle. JAERI actively engages in developing nuclear energy, radiation application and the research on nuclear safety. Those two organizations have a close collaboration with the private sector, including shared funding on some projects. Since 1985, the Nuclear Ship Research and Development Agency has been integrated in JAERI. The Agency of Natural Resources and Energy carries out various activities, which include studies of improvements in reactor design and approval of design modifications proposed by utilities, and decommissioning. In addition to the LWRs for power production, Japan is active in developing other types of reactors, such as HTGRs and FBRs. Toshiba Corporation and the Tokyo Institute of Technology are developing a natural circulation, simplified LSBWR with passive safety systems and a long operating cycle: within 100 - 300 MWe power capacity and 15 years core life. HTGR development is at the stage of operation and testing of a test reactor. The principal focus of Japan's HTGR development program is the High-Temperature Engineering Test Reactor (HTTR) in the JAERI at Oarai site, Ibaraki Pref. Initial criticality of the HTTR was achieved in November 1998. This 30 MW (th) helium-cooled reactor is being utilized to establish and upgrade the technology of advanced HTGR, and to demonstrate the effectiveness of selected high-temperature heat utilization systems. The HTTR accomplished a full power operation of 30 MWth and a gas temperature of 950 ? at the reactor outlet in April 2004.Also, a project has been initiated to develop a 600 MWth gas turbine HTGR design for electricity generation. JNC is conducting research and development (R&D) on FBRs and nuclear fuel reprocessing technology to establish an economical nuclear fuel cycle. The experimental fast reactor (JOYO) operated from 1982 to 2000 with the MK-II core (100 MWt). The reactor and its cooling system was upgraded to the MK-III core (140 MWt) and attained its initial criticality in July 2003. At present, various irradiation tests of fuels and materials to be applied to the fast reactor are in progress. The prototype Liquid Metal-cooled Fast Breeder Reactor (LMFBR) MONJU with a capacity of 280 MW(e) reached initial criticality in April 1994, and was connected to the grid in August 1995. The reactor operation was interrupted in December 1995 due to sodium leak in the non-radioactive secondary cooling system. Legal application for improvement of the MONJU plant, mainly for countermeasures against sodium leakage, was permitted in December 2002. The MONJU reactor is considered the core of R&D activities for FBR cycle technology and considerable effort is being made to resume its operation. In addition to these development works, "Feasibility Study on Commercialized Fast Breeder Reactor Cycle Systems" undertaken by JNC with the cooperation of electric utilities and other interested parties is in progress with the objective of presenting an optimal commercialization vision of FBR technologiy and a research and development program toward that end. Bilateral nuclear power co-operation agreements have been concluded for the purpose of promoting the peaceful use of nuclear power while ensuring that nuclear power equipment and materials, including nuclear materials, have solely peaceful applications. Japan has concluded such bilateral nuclear power co-operation treaties with six nations: the United States, Britain, France, Canada, Australia and the People's Republic of China. Under these agreements, the parties exchange expertise and information on the peaceful use of nuclear power, and provide and receive nuclear equipment, materials and services. Japan cooperates with Asian and developing nations through the Forum for Nuclear Cooperation in Asia, under the framework of the Regional Cooperative Agreement for Research, Development and Training Related to Nuclear Science and Technology, and under various bilateral co-operation agreements. Japan, together with some Western countries, provides technology safety assistance to former USSR nations, and Middle and Eastern Europe nations, under bilateral or multilateral frameworks. Research, development and utilization of nuclear energy, while securing safety, requires the nurturing and retention of the best people - the best human resources. Japan's universities, which are at the core of human resource development, must therefore take the initiative in this effort, in cooperation with organizations such as research and development institutes and private nuclear operators, and with an international perspective as well. At the same time, hands-on experience can be effectively provided at advanced, cutting-edge research and development facilities. Developing, maintaining and continuing high levels of technology and human resources are best achieved through on-going manufacturing activities. The nuclear power industry thus makes continual efforts to introduce the latest technology. At the same time, nuclear operators are expected to improve their own education and training, evolve their accumulated technology still further on their own, and pass that technology on steadily to future generations. It is also important for national research institutes and private nuclear operators to establish methods to facilitate mutual exchanges of personnel and technology, such as joint research and assignments, and to work to strengthen the human-resources and technological positions of Japan as a whole. In order, moreover, for nuclear energy to attract and inspire promising individuals it is important to demonstrate to them the importance of nuclear energy to Japan and the role nuclear energy can play toward achieving international peace and stability. It is just as important that research and development activities cover a wide range of possibilities, be challenging, and fire hopes and dreams among the young. Scientists and engineers involved in nuclear energy should take every opportunity to speak enthusiastically to the public. 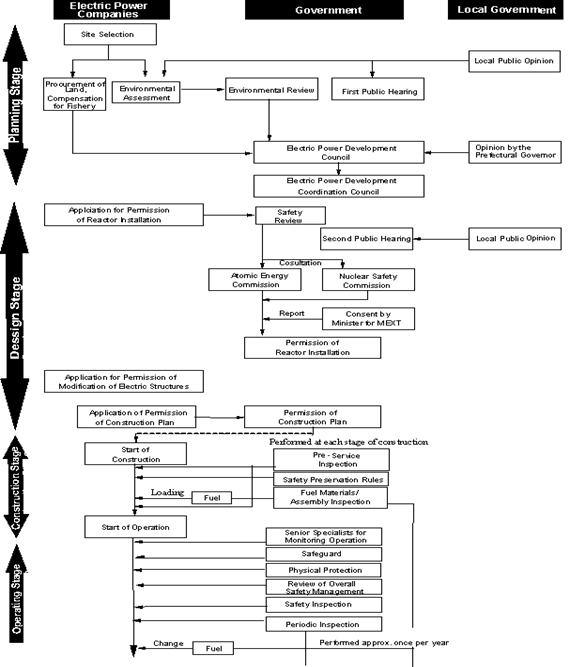 Figure 5 shows the process of approval of or permission for nuclear power plants in Japan. 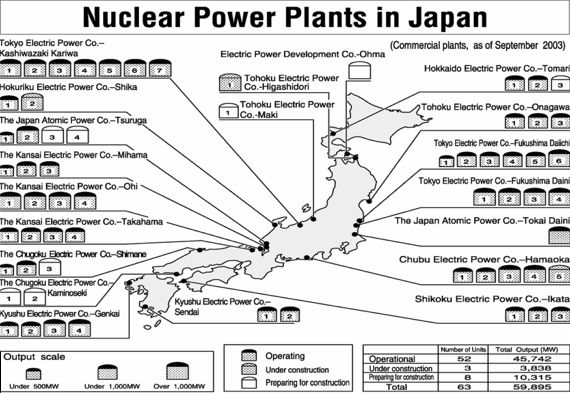 Figure 6 shows the main laws controlling nuclear power plants in Japan. For the installation of a commercial nuclear power plant, it is necessary to go through licensing procedures based on more than 30 laws. Many of the laws also apply to general industrial facilities. 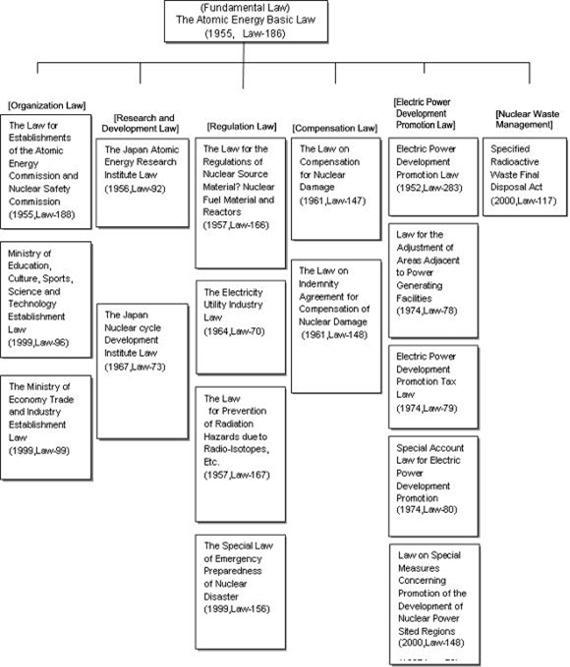 The main nuclear-related laws and regulations are systematized according to organization, research and development, regulations, and compensation based on the Atomic Energy Laws, as shown in Fig. 6. Among them, laws concerning the safety regulations of reactors are the Law for Regulation of Nuclear Source Materials, Nuclear Fuel Materials and Reactors (hereafter called LRNR) and the Electricity Utilities Industry Law (hereafter called EUIL). The purpose of the LRNR is to enforce regulations based on the potential danger of nuclear reactors and nuclear substances, whereas EUIL aims to provide a good supply of electricity, ensuring the safety of hydroelectric power plants, thermoelectric power plants and power transmission lines as well as nuclear power plants, with a view to a stable supply of electricity. Thus, the two laws stand on different viewpoints. Nuclear-related laws and regulations are enacted based on the spirit of the Act. LRNR excludes permission for a construction plan, pre-use inspection and periodical inspection, for which the Electricity Utilities Industry Law applies. The Law intends to prevent radiation hazards by regulating the use and disposal of radioisotopes and the use of radiation producers. In a nuclear power plant, the Law applies when neutron sources are used or radioisotopes are employed for calibration of equipment. Nuclear energy enterprises (electric power companies) owe no-fault liability for compensation to the injured when nuclear damage is caused by the operation of nuclear reactors and the like. In such cases, liability focuses on the nuclear energy enterprises concerned. When damage is more than the deposited amount for compensation, the government will assist if necessary. These Laws intend to promote electric power development by returning benefits gained for the whole country from a stable supply of electricity through the siting of a power plant, to the local area. The Electric Power Development Promotion Tax Law is for collecting the tax of the promotion for Electric Power Development (according to electric power sold), the Special Account Law for Electric Power Development Promotion is for clarifying the government accounts of the uses of the tax revenue, the Law for the Adjustment of Areas Adjacent to Power-Generating Facilities is for smoothly setting up generating facilities by the promotion of public institutions, and the Special Account Law for Electric Power Development Promotion is to promote the development of nuclear power plant site regions by giving financial assistance and so on, focusing especially on protection against the spread of nuclear accidents. The law prescribes, mainly, the establishment of implementation for disposal, a funding mechanism for securing disposal costs, and a three-step site selection process. Japanese society, economic structure and energy demand-supply structure have been undergoing tremendous changes. Based on this recognition, producing an outlook for energy demand and supply from the broader perspective is crucial.In order to show the long-term, quantitative prospects, since December 2003 the Energy Supply and Demand Subcommittee, Advisory Committee for Natural Resources and Energy has been amending (revising) the Long-term Energy Supply and Demand Outlook, looking to 2003. In October 2004, the Interim Report was compiled. In the interim draft, the economy, society and energy supply-and-demand structure up until 2030, and the steps along the way, are envisioned and qualitatively studied and compiled in several scenarios. The energy supply-and-demand structure of Japan in 2030 is shown quantitatively, and sensitivity analyses performed based on these scenarios. Keeping observance of the Kyoto Protocol in mind, the energy supply-and-demand structure in 2010 is also estimated. Furthermore, mid- and long-term energy strategies based on the outlook for 2030 are also examined. Looking ahead to 2030, if current trends continue, growth in energy demand will slow after peaking in FY 2021, and then decline, due to changes in population, the economy, and the social structure. In the sensitivity analysis, the possibility that energy saving will progress through a change in consciousness of people and companies and through technical innovation, and the possibility that new supply means including fuel cells will be realized are shown. To realize a desirable energy supply-and-demand structure, four mid- and long-term energy strategies are proposed. In the Outlook for Energy Demand and Supply in 2010, CO2 emissions are expected to significantly exceed the target values set out in the Guideline for Measures to Prevent Global Warming. The possibility of achieving the target by taking additional measures on the energy supply side, such as streamlining the environment or measures beyond the domain of the industrial sector, towards rationalization of energy use, and on the energy demand side, additional measures such as reduction of the CO2 emissions of the electric power industry, and promoting the introduction of new forms of energy, was indicated. To investigate future reform of the electricity sector, a series of meetings of the Advisory Committee for the Natural Resources and Energy Agency's Electricity Industry Committee were held from November 2001 to February 2003. Finally, the Committee issued the "Framework of the Desirable Future Electricity Industry System" Report in February 2003, which indicates the framework and directions of the electricity industry reform. Based on the Report, the Government of Japan amended the Electricity Utility Industry Law in June 2003 and is now examining in detail measures to implement new regulations and systems. In this reform, the scope of liberalisation will be extended (from 2004 for high-voltage over 500kW customers and from 2005 for all high-voltage customers), and new regulations will be introduced in order to ensure fairness and neutrality of the transmission/distribution segment: for example, introduction of conduct regulations (account unbundling, information firewalls and prohibition of discriminatory treatment) and establishment of a neutral transmission system organisation. Furthermore, a nationwide wholesale power exchange will be created in order to establish an investment environment for electric power source development, and "pancaking" will be abolished for vitalization of the nationwide power trade. On August 9, 2004 at the Mihama Power Station Unit 3 (PWR, 826MWe) of the Kansai Electric Power Co., Inc. (KEPCO), the main condensate water pipe ruptured and high temperature secondary water blew out into the turbine building when the reactor was in full power operation. In the turbine building, there were many workers preparing for the periodic inspection which was to commence on August 14. Workers who were close to the break were seriously exposed to the flashed water that killed five by scalding. The Japanese government set up an Investigation Committee on the Pipe Rupture Accident immediately after the accident and conducted an on-the spot inspection. Through these steps, the government investigated the causes of the accident and took measures to prevent a recurrence. On September 27, the Interim Report of the Investigation Committee was published. The government decided to immediately implement necessary measures for the prevention of recurrence in response to comments of this report. The Japan Nuclear Cycle Development Institute is undertaking two underground laboratory projects, one in Mizunami with the geological media of crystalline rock and the other in Horonobe with sedimentary rock, to enhance both technical reliability and public confidence in HLW geological disposal. At Mizunami, excavation of the main and ventilation shafts began in July 2003 and reached to the depth of about 50m in December 2004. At Horonobe, surface-based investigation started in March 2001 and the site for the URL construction was chosen in March 2002. At present, site preparation work is in progress aiming at the start of shaft excavation in the summer of 2005. Nuclear Power Yearbook, Japan Atomic Industrial Forum, Inc.
Table 8 shows Japan's co-operation with major international organisations. IAEA Promotion of peaceful uses of atomic energy (safety-related co-operation, technical aid to developing countries and R&D), and provision of safeguards to ensure that nuclear activities are not transformed for military purposes. Japan participates positively in INSAG (International Nuclear Safety Advisory group), NUSSAC (Nuclear Safety Standard Advisory Committee), ASSET (Assessment of Safety Significant Event Team), OSART and special studies to evaluate the safety of reactors in the former USSR. Japan made an Extra-budgetary Contribution to the IAEA for 1) the Expanded program of public understanding of nuclear energy (EPPUNE), 2) Nuclear Safety and 3) Waste Management and Disposal. OECD/NEA The purpose is to provide useful information to member countries through technological study and mutual co-operation regarding common problems in nuclear energy use in advanced countries. Japan participates actively in CNRA (Committee for Nuclear Regulatory Activities), CSNI (Committee for Safety of Nuclear Installation), RWMC (Radioactive Waste Management Committee) and NDC (Committee for Technical and Economic Studies on Nuclear Energy Development and the Fuel Cycle).